Looking down over the Grand Staircase in the eastern half of the piano nobile is a large and magnificent ceiling painting of Fame & Victory by the Venetian painter Francesco Sleter. 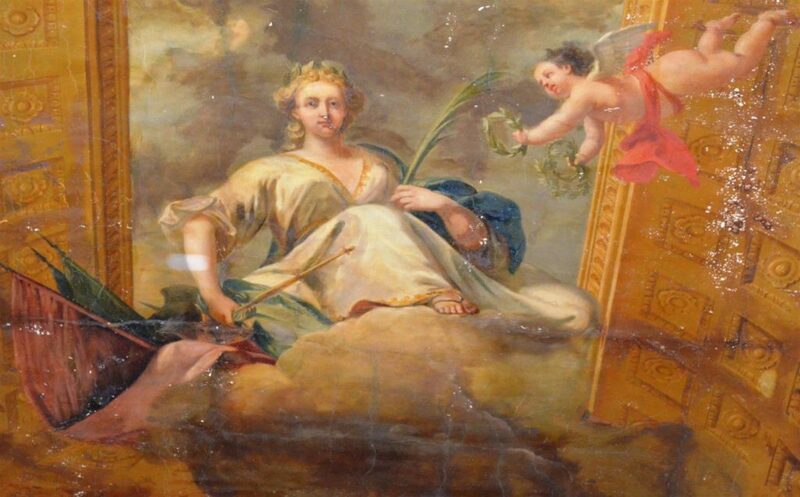 The painting was one of several on the theme of justice and martial success commissioned by Lord Cobham in the 1730s. Companion pieces Justice & Peace and Plenty may originally have been over the landing, but no longer survive. 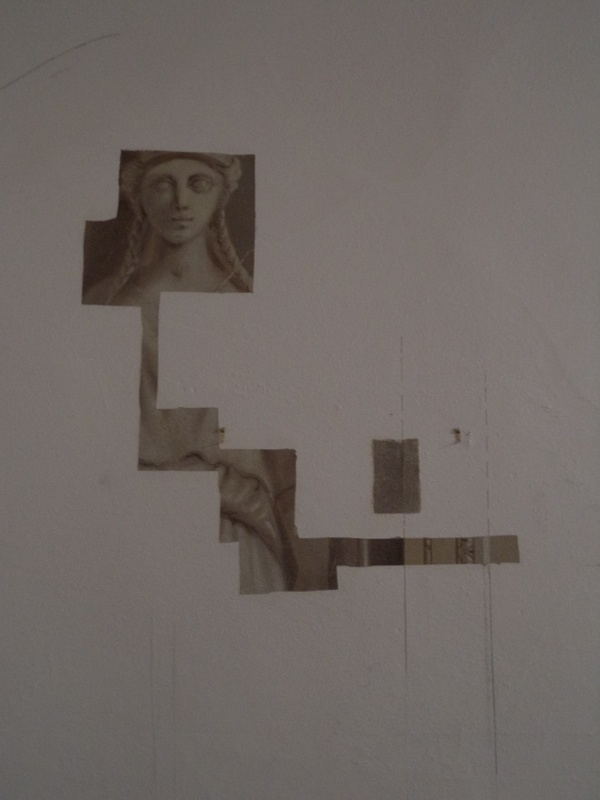 The condition of Sleter’s remaining work was poor, with the mural sagging from the ceiling above and the paint flaking. 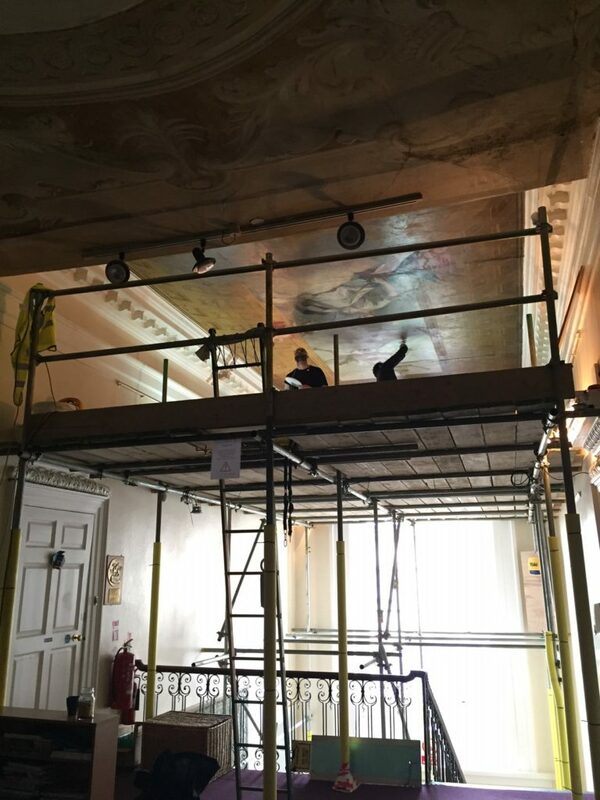 Consequently, a programme of conservation was carried out in spring 2016, which began with the removal of the floorboards above the painting. The bond between floor and plaster underneath it was discovered to be failing, a problem compounded by water ingress. 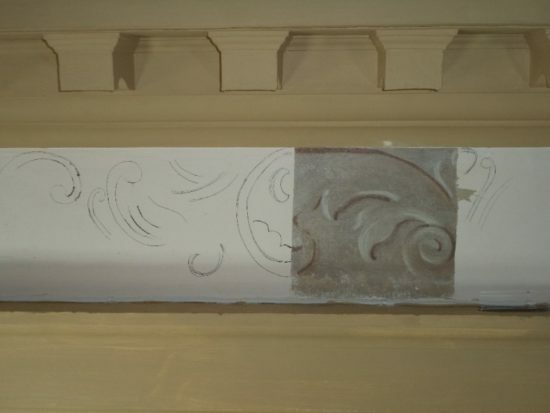 Once this plaster base had been consolidated, work could begin on the delicate task of restoring the painting itself. Specialists from Hirst Conservation used ultra-violet scanning and carried out detailed paint analysis to identify at least four earlier phases of work on the painting, including retouching in the mid-19th Century, in the 1960s and again in the 1980s. 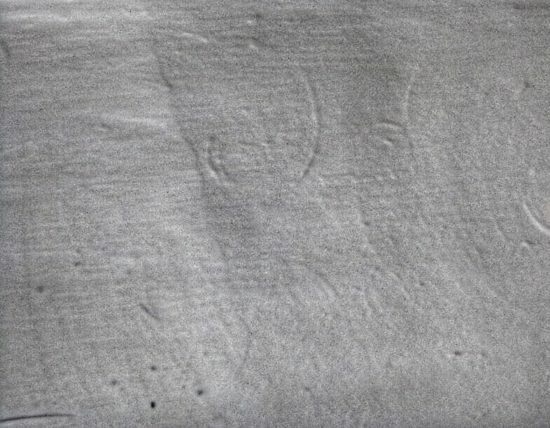 The painting was re-cleaned, with some later interventions removed, before minimal retouching to the original and the application of a single protective layer of varnish. The scaffolding was removed in the summer to reveal Sleter’s scheme in all its magnificence. The paint analysis of the cornices below Fame & Victory revealed six schemes of decoration, the earliest being contemporary with the painting. 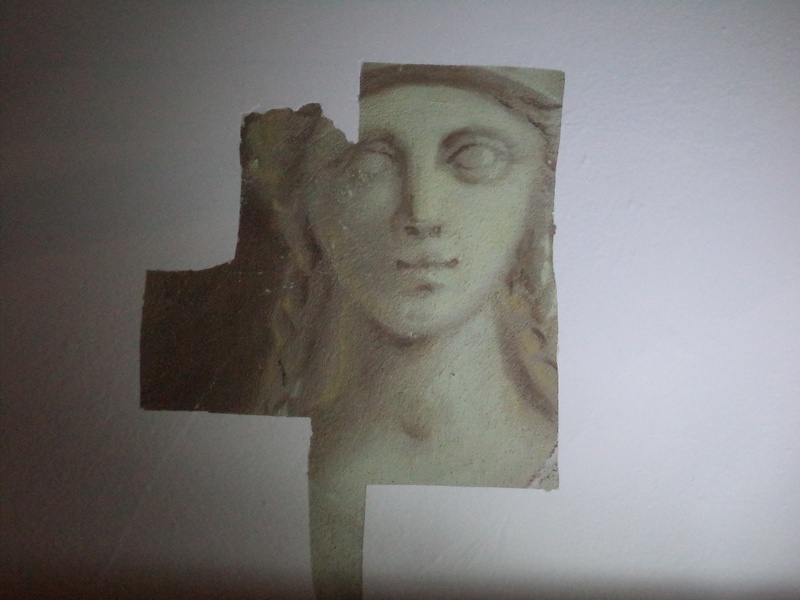 Amongst these, on the walls below the mural, conservators found evidence of previously unseen decoration which may extend all the way down to the skirting. 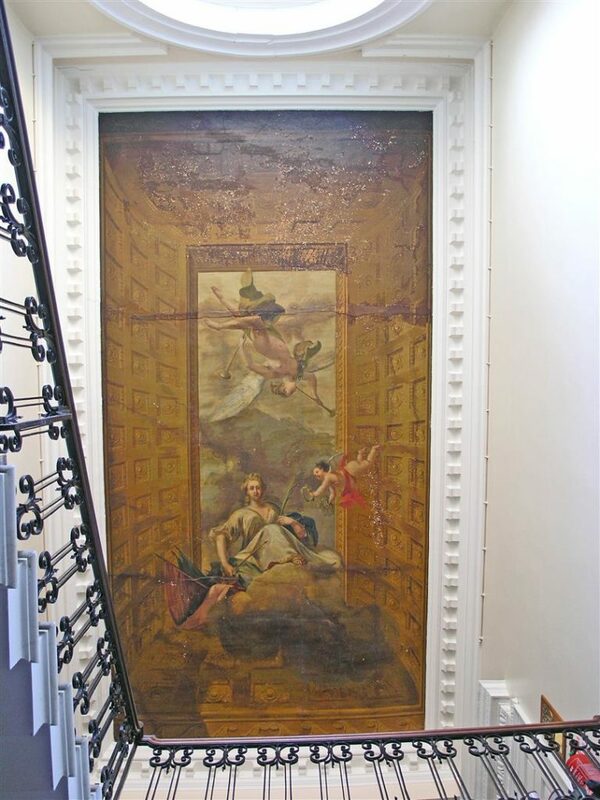 Raised lines and markings may reveal the presence of painted niches, cartouches, overdoor panels, architectural pediments and friezes covering the walls and now hidden by later layers of paint. Conservation is always a work in progress, so this will remain a potential future project, but the team at Stowe will leave a small number of ‘windows’ to allow a view of the earlier scheme and to remind people of the possibility of a future restoration project.